Go 'Head Stern- GET SOME. ~ Roundball Manor - The House that Basketball Built. Commish David﻿ Stern threw a grenade back at Jim Rome yesterday in response to Rome's inquiry on his radio show about the NBA Lottery being fixed: "Have you stopped beating your wife yet?" Stern replied. Whoa fella. 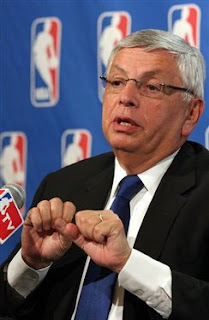 With game 1 of the NBA Finals receiving it's highest TV rating ever, one can understand Stern's annoyance at the question, especially coming from Jim Phoney, but it opens the door up to some discussion about the commish's discretion. At the very least it warrants the photos below. Game 2 tonight! 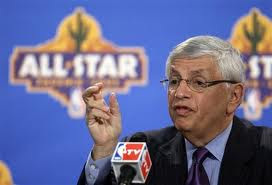 Stern demonstrating what he did to his wife the last time "she mouthed off"
Stern giving play-by-play from the last time he "fish-hooked" his old lady for not having dinner ready.